The March issue of Strategy and Leadership had a powerful article by Eric J. McNulty who is the director of research at the National Preparedness Leadership Initiative. He says occasionally, a new word or phrase breaks out of the confines of the business world and into the cultural conversation. Paradigm shift and synergy had their day. Then sustainability and resilience. More recently, agile and lean seem to be everywhere. There were many such buzz words TQM, Re engineering, Empowerment etc. Often, the word comes out of genuinely original thinking and can stimulate new practices. Without care, however, it can quickly spiral into overuse and achieve buzzword status. In this article, he says there's a word that is unlikely to join this list, though it accurately captures and communicates the essence of today's leadership challenges. It is the common conjunction and. He says the complex issues of today cannot be solved with simple bifurcated choices. They require nuanced thinking. He says the word has a magic as it subtly reframes whatever topic that is on the table. The use of the word is an invitation to mutually solve a problem. The shift of one word acknowledges each person's interests as legitimate and recognizes that there are issues to be resolved. It creates an environment for positive dialogue. Leaders today are expected to be mythic and have answers that eludes average people and simultaneously be approachable. It is no longer an either/or decision. Paradoxes have to be embraced. I remember Bob Pike the legendary Trainer's Trainer talk about not using either/or but using and, many years ago when demonstrating a learning point through an envelope exercise. He goes on to add that the and lesson for leaders here is to again embrace the paradox and move beyond simply amassing authority. Build a leadership platform that facilitates independent yet aligned participation and connection by the nodes in your network. When you seek to involve employees and communities as well as customers, and will open more doors than but. Confronted with complex challenges, dynamic markets, and fast-changing technologies, and is not only more powerful than or it may be the only option for dealing with the multiplicity of factors involved. As you lead, try substituting and for but as often as possible. Note what opportunities for collaboration and novel solutions emerge. When contemplating your next strategic move, think about and instead of or. See what new perspectives this generates. And is one small word that can make a big difference in the way you think and lead. I had the opportunity of delivering the closing key note for the Regional World Institute for Action Learning 2017 (WIAL). My second keynote for the year (my goal is to only do 4 keynotes for charity this year) connected me to Dr. Mike Marquadt whom I had met with my former colleague Jeremy Spoor, may be 25 years ago, at the American Society of Training and Development. I doubt he remembered me but he sure was extraordinarily pleasant and made me feel welcomed. The forty-five minutes? keynote connected me to the training and development community after so many years. Many old friends and new entrants to the profession from the region were charming and effusive in their greetings. It was a nice feeling. I spoke as an entrepreneur talking about leadership and how it could be developed with action learning in a very uncertain and ambiguous world. It was a different experience. I spoke no longer as a trainer but as an entrepreneur who could quickly feel the impact of talent creating engines and talent pipelines. 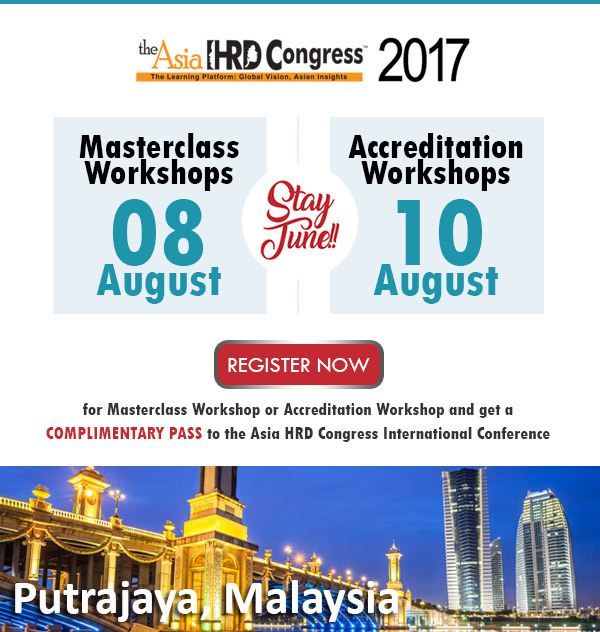 Asia HRDCongress is scheduled at Putrajaya ? the Le Meridian Hotel, IOI City ? Masterclasses on August 8th, the International Conference on 9th and followed by Accreditation workshops. The nominations for the Asia HRD Awards are open, Nominate individuals and organisations who you think deserve to be recognised for their work. The independent committee will make an informed judgement to decide on the awardees.